Ticketing is open for Immaculate Heart High School's Annual Alumnae Reunion. Click HERE to reserve your tickets for a day of celebration with classmates, as well as the opportunity to add Finlay to your family! The annual Alumnae Reunion will be held on Sunday, May 5. Celebrating years will end in -4 and -9. The day will begin at 10:30 a.m. with a social hour, and will conclude after a 1 p.m. luncheon following the welcome and celebrating class program. In addition to the usual festivities, there will be an auction featuring Labradoodle Finlay. Born in February, he is intelligent, personable and willing to please. He has been introduced to crate training and the leash, and he has started housebreaking. He is a mini-medium Labradoodle and will mature at around 30-45 pounds. 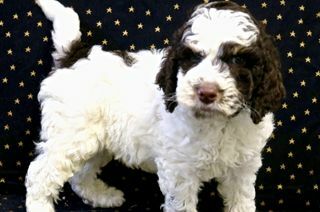 Don't miss this opportunity to add "panda puppy" Finlay to your family! An independent, Catholic, college preparatory school for girls in grades 6 through 12, Immaculate Heart has been located on a beautiful hillside property in the Los Feliz area of Los Angeles since our founding by the Sisters of the Immaculate Heart of Mary in 1906. We celebrate more than a century of nurturing the spiritual, intellectual, social and moral development of students as they distinguish themselves as women of great heart and right conscience.